In an effort to tackle climate change, and in blunt defiance of the newly adopted federal regulations, California Governor Jerry Brown has signed a bill stipulating that all state electricity must be produced with carbon-free sources by 2045. Brown’s action, taken shortly before his retirement, is regarded as the most comprehensive to date in the fight against climate change and bears immense significance seeing as California constitutes the world’s fifth largest economy. Yet, Brown’s efforts and proclamations surrounding the signing of the bill raise a plethora of questions and concerns. According to The Guardian, in addition to signing a bill which requires the complete transition into carbon-free electricity production by 2045, Brown has also issued an executive order ruling that California must “completely eliminate net emissions across its economy, including transport and agriculture, by the same year.” California will also be required to soak up more greenhouse gasses than it releases into the atmosphere by 2046; it will do so by expanding forests and exploring new technologies such as injecting carbon underground. Brown’s ambitious plans to reduce carbon emissions come as a result of the growing devastation inflicted upon California as a result of climate change: from historic wildfires, droughts, storms, and pollution-related deaths, to projected rising sea levels that would eliminate approximately two thirds of the state’s beaches by the end of this century. Numerous politicians and environmentalists, however, are critical of Brown’s crusade against climate change, claiming that he is primarily concerned with leaving behind a legacy rather than take substantial steps to reduce emissions. In an interview for The Guardian, May Boeve, executive director of 350.org (a global grassroots climate movement), contends that Brown has “permitted more than 20,000 new oil and gas wells up and down California during his tenure.” Others have doubted whether his new policy would do enough to reduce air pollution in areas near highways and industrial facilities, which disproportionately affects members of racial and ethnic minorities. While the president has proven to be a serious foe of Mother Earth, and although his administration has taken sinister positions on climate change – scrapping valuable policies and enabling an increase of carbon emissions, it would be irresponsible to portray him as the primary culprit when it comes to global warming, for, after all, he is essentially a symptom – not the root cause of the issue. By framing the president as the sole enemy of the environment, Brown effectively exonerates the dozens of Republican politicians, such as Oklahoma Senator Jim Inhofe, who for decades have been doing all in their power to stifle policies aimed at curbing emissions. Brown’s statement also downplays the role of oil and vehicle industry lobbyists who continuously pressure politicians to cater to their needs and allow them to drill and emit uninhibitedly. The greatest danger in espousing Brown’s position, however, is that it sheds any responsibility from the average citizen, and discourages people from recognising the impact their daily habits have on global warming. And so, while criticising and opposing the administration’s attack on the environment is crucial, leaders such as Brown should refrain from placing the blame solely on ‘easy targets’, such as the president, for this rhetoric may compel people to distance themselves from the issue and ignore the role they play in exacerbating climate change. 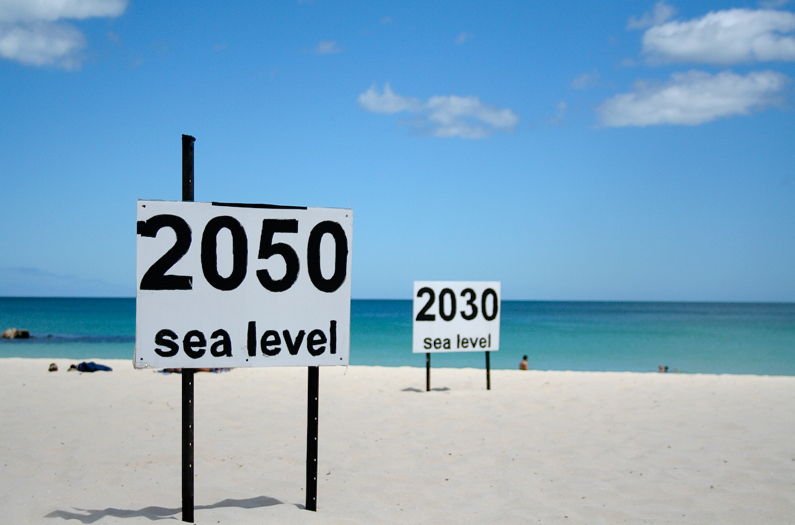 Image: One prediction of where rising sea levels will end up. Example of Cottesloe Beach, Perth Western Australia. Credit: go_greener_oz via Flickr.